Jakarta Governor, Anies Baswedan attended international seminar as a part of Ikatan Guru Taman Kanak-Kanak Indonesia (IGTKI) Sports and Arts Week (Porseni) at Ancol, North Jakarta.
" Please be a good learner thus our next generation can achieve their dreams"
In his welcoming speech, he stated that the most basic education such as PAUD (early childhood education) and kindergarten has the greatest impact to students among other education levels. "Please be a good learner thus our next generation can achieve their dreams," he mentioned on the location, Saturday (11/3). According to him, a good teacher should have character as a learner who can innovate, inspire, and not monotonous. Thus students are always keen to learn. 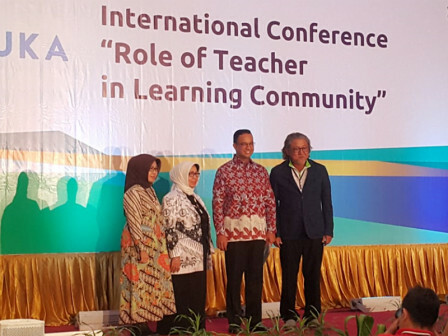 Meanwhile, IGTKI Head, Farida Yusuf informed, there are 2,900 teachers from all regions in Indonesia who participate in this event and also competition regarding learning movement for kindergarten students since November 1. "This Porseni competition is won by Central Java, East Java, and DKI Jakarta," she stated.